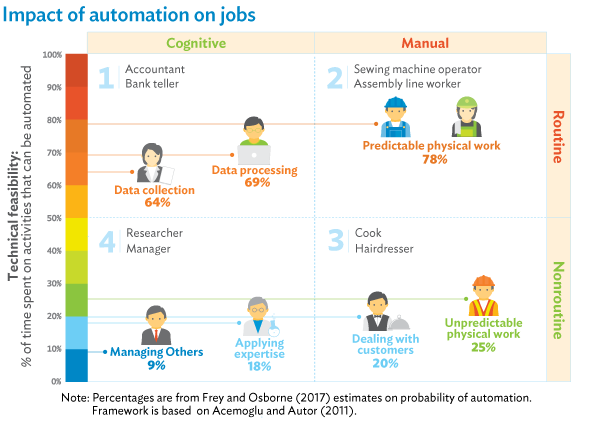 Developing countries in Asia have created 30 million jobs annually in industry and services over the past 25 years, according to the Asian Development Outlook (ADO) 2018: How Technology Affects Jobs. Job creation has been accompanied by improved productivity, rising earnings for workers, and large reductions in poverty. Contributing to this process are shifts in employment from sectors with low productivity and pay, such as agriculture, to sectors with higher productivity and pay. Most increases in productivity come from technological advances such as high-yielding crop varieties in farming, modern machine tools in manufacturing, and information and communication technology in services. The jobs challenge is far from over. From 2015 to 2030, the labor force in developing countries in Asia is projected to increase by about 11 million per year. As a result, Asia needs more jobs but also better jobs. The broad contours of action and policy needed to meet the jobs challenge are well known: timely and appropriate investments in education, infrastructure, and research and development, as well as a policy framework emphasizing macroeconomic stability, openness to trade and foreign direct investment, and an investment climate conducive to business. Note: Data are for 2015 except working age population in India 2012, Nepal 2008, Bangladesh 2013, Fiji 2010, Vanuatu 2009, and Samoa, 2014; youth unemployment and adult unemployment rate in Fiji, Kazakhstan, the People’s Republic of China, and Singapore 2013; informal employment share of nonfarm employment in Thailand 2016, Mongolia 2014, India 2012, Pakistan 2010, Sri Lanka 2009, Indonesia 2009, Viet Nam 2009, and the Philippines 2008. Source: International Labour Organization. ILOSTAT. http://www.ilo.org/ilostat (accessed 1 September 2017). Concern is growing that some elements of the region’s job growth framework will no longer improve labor market outcomes for many workers. Paradoxically, the concern stems from the fundamental driver of human progress throughout history: technological change. While future prosperity is sure to derive from advances in robotics, three-dimensional printing, artificial intelligence (AI), and the internet of things—technologies that enable the often-cited Fourth Industrial Revolution—some of them also pose new challenges for workers. In particular, the growing sophistication of robotics and AI raise the possibility of unprecedented automation and displacement of labor. In apparel and footwear manufacturing, for example, “workerless factories” are being tested using completely automated production. In services, it is becoming technically feasible to automate more complex tasks in occupations such as customer support. How will new technologies affect developing Asia’s ability to generate more and better jobs? Policymakers will have to be proactive if the benefits of new technologies are to be shared widely across workers and society. Governments will need to respond to the risk of workers being left behind by ensuring that they are protected from the downside of new technologies and able to take advantage of new opportunities. This will require coordinated action on skills development, labor regulation, social protection, and income redistribution. Significantly, new technologies can help deliver solutions in many of these areas. Adaptive learning technology, an educational method that uses computer algorithms designed to adjust to individual students, has enhanced learning outcomes in schools; governments should use and promote their adoption. Similarly, technological advances in biometric identification can improve how social protection programs function by reducing costs, overcoming implementation challenges in sophisticated unemployment benefit systems, and enabling the tracking of job-placement services. At the same time, governments also need to ensure that the development of new technologies take place in ways that benefit people and protect their rights and privacy, by, for example, protecting personal data. Governments are tasked with responding to technology and its effects on the labor market. At the same time, they stand to benefit by embracing new technology. From tax compliance and enforcement to smart cities, health care, and education, there is tremendous potential for more efficient and effective delivery of public services. However, governments need to create an environment that enables technology adoption through a two-pronged strategy. As they complete the necessary support infrastructure, they should support research and development and also innovation. Developing Asia has historically relied on abundant labor to support export-led growth. Now it is poised to leverage its expanding middle class to usher in a new era of consumption-driven growth. With the right policies, new technologies can play a key role in this transition.